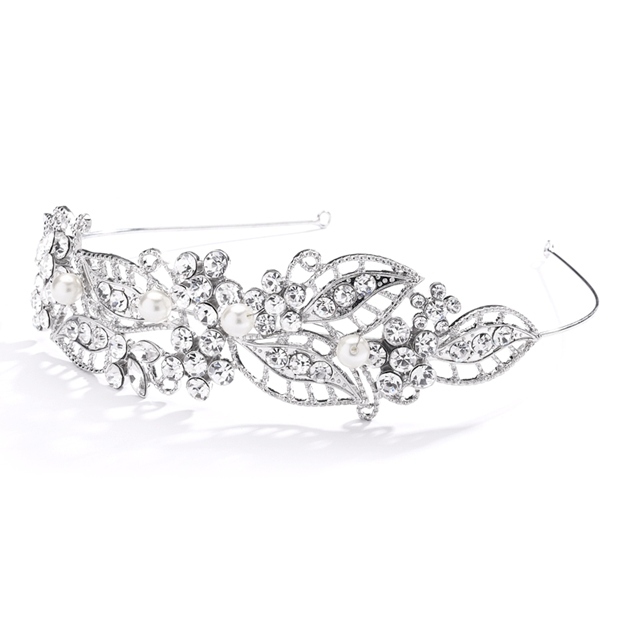 * Mariell's top-selling Wedding Headband or Bridal Tiara (1 1/2" h x 15 1/2 around) is a dramatic look for Proms, Weddings or Graduations. * Enhanced by bold crystal clusters & off white pearls, this glistening tiara is a must-have at its incredible price! * This elegant Bridal Tiara or Wedding Headband has the Victorian understatement of delicate leaves adorned by a touch of 8mm off white pearls hand-wired to the headpiece. * This popular heirloom style Bridal Tiara or Headband has some elements of a classic Wedding, Prom, Graduation or Homecoming look but there is no mistake that there is bold splash of bling with dozens of crystal stones to make this headpiece the crowning glory of any special gown. * At a fabulous low price, don't miss the opportunity to add this best-selling silver rhodium headband to your store's hair accessory display today.